I've learned that most good things in life come when you look beyond the expected. It is nice to be pleasantly surprised from time to time. The same is true for food. 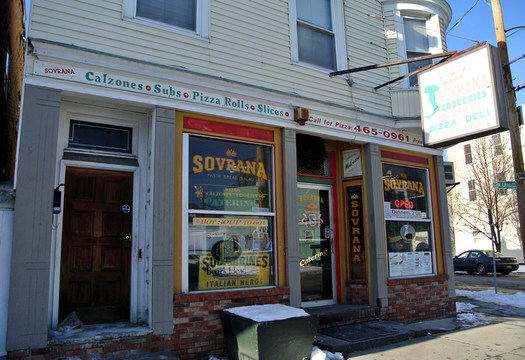 Sovrana's has long been my favorite pizza joint in Albany, since my days in Brubacher Hall at Saint Rose. (When I wasn't studying and writing papers at Mahar's, I was doing the same at Sovrana's). 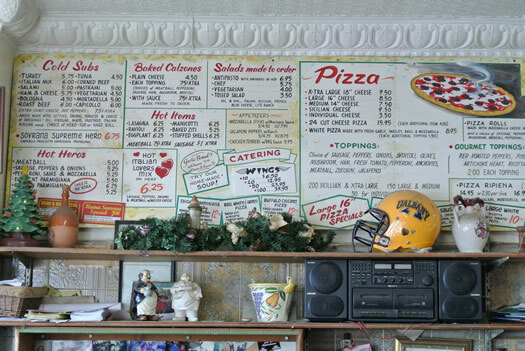 The North Lake Ave shop is a little out-of-the-way, but it's a hidden treasure -- much like the Ã©clair that graces the cold case beneath the pizza counter. Most people probably know Sovrana's for the thick, chewy crust that is the hallmark of the shop's pizza, or perhaps for the giant six-foot party subs that are regularly carried out the shop's front door. Few people consider that the pizzeria might be slinging out some of the best Italian pastries in the area. That's a bold statement, as there is a plethora of good Italian pastry in the Capital District. As I've mentioned before, Albany was founded by the Dutch, colonized by the British, and governed by the Irish. But we eat Italian. 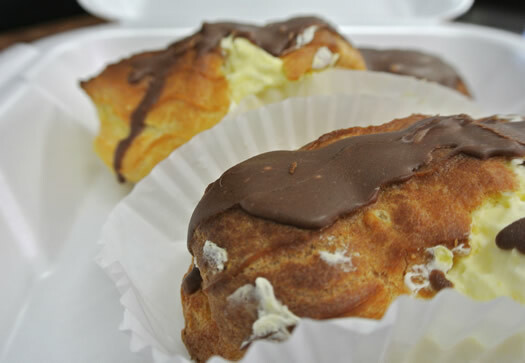 Ã‰clairs are technically a French dessert, consisting of a choux (twice-cooked egg, butter, water, and flour dough) shell filled with custard and sometimes drizzled with a chocolate coating. Everything in Sovrana's Ã©clairs ($2) is house made. The shell is light and airy, though sometimes does suffer the same fate as other refrigerated pastries: a quick passage into staleness. Instead of a crisp, delicate shell, the dough becomes chewy. This says more of the storage issues surrounding Ã©clairs than the technique in which Sovrana's makes them. Much like cannoli, Ã©clairs are best fresh and filled-to-order. The chocolate coating on the top of the Ã©clair reminds me a bit of Magic Shell or a chocolate-flavored ice cream dip one might get from Dairy Queen. It tastes more milk chocolate than anything. 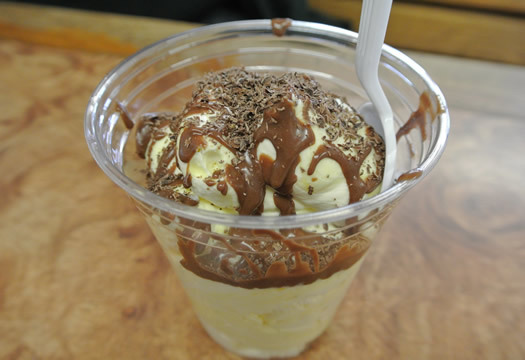 But the thing you should be concentrating on here is the custard. It's not that runny vanilla pudding, or even the off-white, closer-to-whipped cream stuff you find in most Ã©clairs. Sovrana's Ã©clair filling is closer to a room temperature ice cream. It is velvety and golden yellow. Most stuff this color and consistency comes from a factory-made can, but this is a study in expert execution combined with real ingredients -- and a ton of egg yolks. All the lecithin in the egg yolk binds with the sugar, cream, and vanilla (and perhaps a bit of flour) to create custard that is thick without being gummy. I was denied much of a backstory about the Ã©clair recipe, save for that Sovrana's has been around for more than 30 years, and the recipe hasn't changed in that time. Some say the lore surrounding the recipe stretches back a century, coming over from Italy. Sovrana's remains pretty tight-lipped about it all. Most people probably wouldn't walk into a pizza joint in search of other-worldly pastry, but the Ã©clair at Sovrana proves why it is important to keep your eyes open to the world around you. You never know what delight it might present. 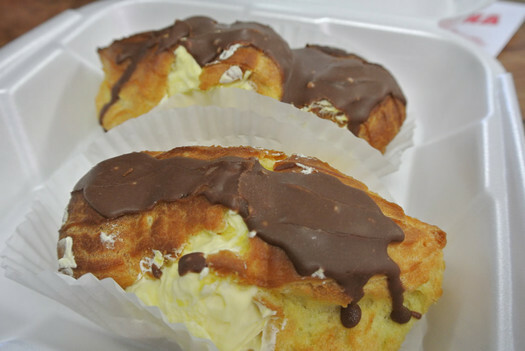 ssssshhhhh, I don't want them to be out of my favorite eclair (or cream puff) next time I'm in! I'm glad to know that the rest of the world thinks them to-die-for though. Yum!!! its all fresh, local, and AMAZING. A true gem in a deteriorating neighborhood. GO THERE!!! SUPPORT LOCALS. I dont know if they still do it but at one time they grew a significant portion of the veggies and meat used there....yes they grew the pigs and made them into sausage.....they grew the eggplant and tomatoes!!! THEY BAKE THE BREAD!!!!!!!! GO THERE! DONT DELAY! Back when I was in college at U Albany in the early 90's Sovrana had a prime location between the then-happening college bars The Long Branch, Peabody's and Town Tavern. And as you can image, drunk college kids are quite good for the late night pizza business and Sovrana's would be packed with lines out the door on the weekends. Their pizza was good, though different than the thin-crusted NYC pizza I was used to. Thick doughy crust and they would throw on a [very] large handful of shredded mozarella on top if you asked (for free! Though they did start to charge for it at some point I think). Man, everyone LOVED Sovranas. Anyway, when I drive by there now it's good to see they're still in business though I have to think the owners long for those years of lines-out-the-door business. Definitely a cool local family-run establishment. Best pizza made by the best people in Albany.